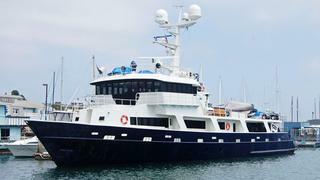 Gregg Morton at Northrop & Johnson in San Diego sends me details of his new listing, the 42.7m expedition yacht Lestralaur. Originally launched as the MV James Sinclair, she was built at John Manley Shipyard in Vancouver in 1981 for the Canadian Fisheries Department to be used as a high speed patrol boat capable of negotiating the rough waters of the Pacific North West. She was converted into a luxury expedition yacht in 2002 by her current owner, who christened her Lestralaur after his daughters Leslie, Tracie and Laura. She can accommodate up to 10 guests in 6 cabins. She underwent a major refit in 2010 - her LOA was increased from 36.36m to 42.7m, she was repowered with brand new MTU 12V 4000 main engines, and fitted with new stabilisers, bow and stern thrusters, as well as many other mechanical and electrical upgrades. She was also modified to accommodate a helicopter on the aft deck. Gregg tells me that she has the range to reach the farthest, most remote locations on the planet. Currently located in San Diego, Lestralaur is asking $10 million.